House price growth across the UK remained "subdued" in March, with prices just 0.7pc higher annually, Nationwide Building Society said. Property values edged up by 0.2pc month on month across the UK, taking the average house price to £213,102 (€248,750). Across England, house prices fell by 0.7pc annually in the first quarter of 2019, reaching £255,683 (€298,454) on average. The fall in the average house price in England was driven by declines in London and the South East - with prices still climbing in many other parts of the country. 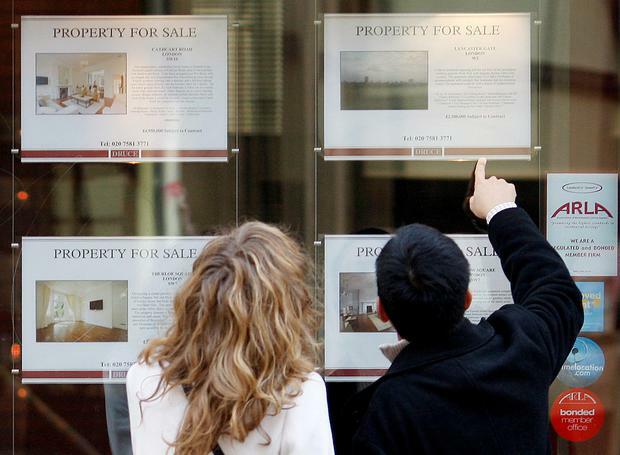 In London, house prices fell by 3.8pc annually in the first quarter of 2019. Nationwide chief economist Robert Gardner said: "London was the weakest-performing region in quarter one, with prices 3.8pc lower than the same period of 2018 - the fastest pace of decline since 2009 and the seventh consecutive quarter in which prices have declined in the capital. "This trend is not entirely unexpected, however, as it follows several years of sustained out-performance which left affordability more stretched. "Policy changes that have impacted the buy-to-let market in recent years are also likely to have exerted more of a drag in London, given that the private rental sector accounts for a larger proportion of the housing stock in the capital than elsewhere in the country." Nationwide said that across the UK, Northern Ireland saw the biggest annual increase in house prices in the first quarter of 2019 with a 3.3pc uplift - although house prices in the region are still well below their 2007 peak. Mr Gardner continued: "Northern Ireland remained the strongest performing home nation in quarter one, although annual price growth softened to 3.3pc, from 5.8pc last quarter. "Scotland saw a slight pick-up in annual price growth to 2.4pc, while Wales saw a marked slowing in growth to 0.9pc (from 4pc last quarter)." "However, prices in Northern Ireland are still more than 35pc below the all-time highs recorded in 2007," he said. Howard Archer, chief economic adviser at EY Item Club, said: "March's soft house prices reported by the Nationwide maintain the view that the housing market is currently being hampered by challenging conditions, with buyer caution currently being reinforced by heightened Brexit and economic uncertainties - although there are significant variations across regions with the overall picture being dragged down by the weakness in London and the South East." Mark Harris, chief executive of mortgage broker SPF Private Clients, said the figures show "some areas are struggling more than others". Sam Mitchell, chief executive of online estate agent Housesimple, said: "Monthly figures are starting to show a common theme, with positive growth in the Midlands and North of England and negative growth in and around London. "This is likely to be the pattern for the foreseeable future, until the EU situation is resolved at least, as the impact of protracted Brexit negotiations drags more heavily on the London market. "The market would have preferred a decision one way or the other. Instead, we are now in this state of short-term limbo, leaving many buyers and sellers unsure what to do.